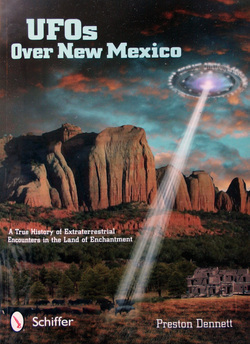 UFOs over New Mexico is the first book to present a comprehensive history of UFO encounters in the Land of Enchantment. The fifth largest state in the U.S., New Mexico has an incredibly long and complicated history of extraterrestrial encounters, reaching back to the 1880s and continuing to the present day. Many of the encounters have had a profound effect on how we view the UFO phenomenon today. of the state’s military and atomic bases experienced a series of dramatic low-level fly-overs by mysterious objects. The following decades brought hundreds of cases, including the incredible Farmington UFO wave, an incredible flap of anomalous green fireballs, a sighting by astronomer Clyde Tombaugh (discoverer of Pluto), a series of UFO/car-stalling incidents that caused concern at high levels of ourgovernment, and much more. including such well-known cases as the contacts of scientist Daniel Fry or Air Force Sergeant Charles Moody. Roswell incident. The state has produced literally dozens of UFO crash/retrieval cases – more than any other state by far. Widespread cases of cattle mutilations and the unique phenomenon known as the “Taos Hum” provide a unique twist. cases, and vivid color photographs will leave you searching the skies. “A silver disk that wasn’t there. begun, and one century later, by 1696, the Spanish conquered the entire state. gave up claim of the area to the new nation of Mexico. Under Mexican rule, the borders became opened for the first time to Americans, attracting merchants, trappers and others. In 1841, the new Texas Republic tried unsuccessfully to lay claim to the area. Then, in 1846, war broke out between the United States and Mexico. On August 18, 1846, New Mexico officially became a part of the United States. It was denied statehood, but instead, in 1850, became the Territory of New Mexico (which also included the area of Arizona.) In 1863, the two territories were divided. For the next 62 years, New Mexico remained a territory, in part because Congress feared that democracy would not work in a Spanish speaking community and because residents feared higher taxes. However, in 1898, public schools began teaching English, and fourteen years later on January 6, 1912, New Mexico officially became the 47th state. By this time, the population hovered just above 200,000. The fifth largest state, New Mexico has an area of 121,593 square miles, approximately one-third of which remains owned by the federal government. Its lowest elevation is 2817 feet at Red Bluff Lake, and its highest elevation is 13,161 feet at the summit of Wheeler Peak. The eastern third of the state is part of the Great Plains. The state is also very mountainous. The north central part of the state includes an extension of the Rocky Mountains. In the east are the Sangre de Cristo Mountains and to the west are the Nacimiento Mountains. There are numerous mountain ranges and desert basins in the central and southwestern part of the state, while the northwest quadrant is part of the Colorado Plateau. The climate is mild and arid, with low humidity and a wide temperature range. New Mexico contains more than 6000 species of plants, and 23% of the state is forested. The state is rich in natural resources, containing large reserves of coal, petroleum and natural gas. It is also extremely rich in minerals including resources of gold, silver, copper, iron ore, lead, manganese, molybdenum, zinc, potash, and perhaps most importantly uranium. The state ranks second in uranium production and contains half of the country’s known reserves of uranium. classified United States’ Government research into nuclear energy. In 1943, the secret city of Los Alamos became the birthplace of the Atomic bomb. Later came White Sands Missile Range, Kirtland Air Force Base and nuclear research installations in Albuquerque. These new developments, and a fast-growing tourist industry soon caused the state’s economy to boom. By 1970, more than one million people lived in the state. And so New Mexico’s prominent position in the United States became assured. Of all the state’s in the United States, New Mexico has one of the most complex histories of UFO and extraterrestrial encounters. Sightings began early as 1880. However, it wasn’t until the arrival of the Atomic Age in 1945 that UFO activity exploded. Perhaps because of its research into atomics, the state of New Mexico – perhaps more than any other state – became the focused target of the UFO phenomenon. New Mexico’s UFO history is rich with high-profile UFO cases that have had a profound affect on how the phenomenon is perceived and understood. The first sightings to gather attention occurred in 1947, when a wave of sightings swept across the United States. In New Mexico, most of the activity was concentrated over military and atomic installations. 1947 was also the year of the now-famous Roswell UFO crash, forever putting New Mexico on the frontlines of UFO research. In 1949-1950, New Mexico was uniquely targeted by a wave of mysterious green fireballs – causing great concern at high levels of the Air Force. The 1950s and 1960s brought dozens of “classic cases” including the Farmington UFO display, the Socorro Landing, continuing visitations over White Sands, Holloman AFB, Kirtland AFB and other sensitive installations, dozens of car-stalling cases, the abduction of Sergeant Charles Moody, the contacts of Dr. Daniel Fry, and a growing number of civilian cases. From 1948 to 1965, Project Blue book investigated scores of New Mexico cases, more than two-dozen of which remain unidentified. Mexico and surrounding areas, but was later discovered to be widespread. The 1980s brought more sightings, landings and abductions, and rumors of underground alien bases, the unique “Taos Hum” and the deepening mystery of animal mutilations. area is of great interest to the UFOs. ability to affect electromagnetic machinery. the object, as it flew a few hundred feet alongside the highway. speed over the town of Clovis. quickly, that it left what appeared to be a streak of light. claimed to see a UFO fly overhead. away when the object suddenly began to ascend at a 45-degree angle. that the object made a controlled landing and ascent. Stokes estimated at 2500 mph. from a giant sun lamp. There was no sound and no visible portholes. Stokes receive a physical examination from the Base doctors. newspapers, and had in some cases, been viciously attacked as a hoax. convinced that Stokes had, in fact, had a genuine sighting. There were also other sightings on the day of Stokes encounter. hover at 45 degrees elevation in the western sky for about five minutes. another (or the same) object on radar. up and start “looping” where the object had disappeared. the cars causing the car lights and engines to fail. and then become dim, eventually appearing to land outside the city. that he had seen a “huge red object” just outside of Vaughn on U.S.
light which approached their car as they drove along U.S.
accelerating at a high rate of speed into the distance. employees were talking freely with the media about their encounters. action may be taken against the offender. Albuquerque: Cactus 564, say again. all in that particular area, that object that’s up in the air? Albuquerque: It’s up in the air? Albuquerque: What’s the altitude about? Cannon AFB: Cannon, go ahead. length is unbelievable and it has a strobe on it. Albuquerque: This is not good. Cannon AFB: What does that mean? Nighthawk: You got any traffic off our left wing right now? us…just went off our left wing. goes right counterclockwise, and it was a pretty eerie sight. between NORAD and Albuquerque Air Traffic Control. NORAD: We don’t have anything going on up there that I know of. NORAD: And oh, you all are serious about this? three or four minutes now. NORAD, as they were exempt from the FOIA.